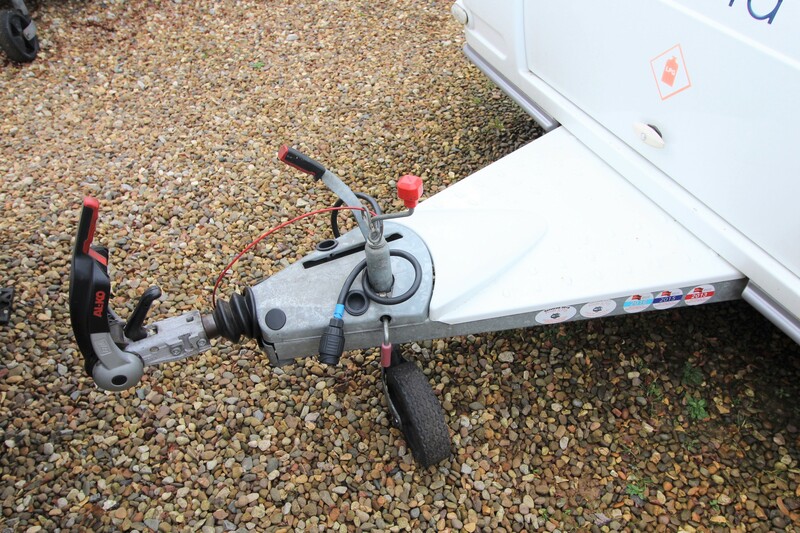 If you're looking for a caravan with an exciting layout then this is the one for you. 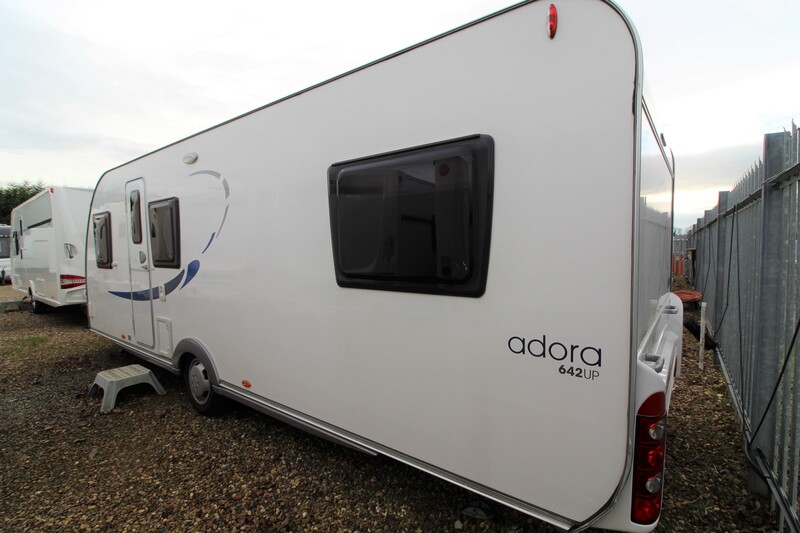 This Adria has the benefit of two fixed single beds at the rear that can be either used as separate beds or can be pushed together to create a double bed. The L Shaped lounge provides ample space for the whole family to convene at meal times, there is a large table which is height adjustable and is also used as part of the bed base to create a large double bed. 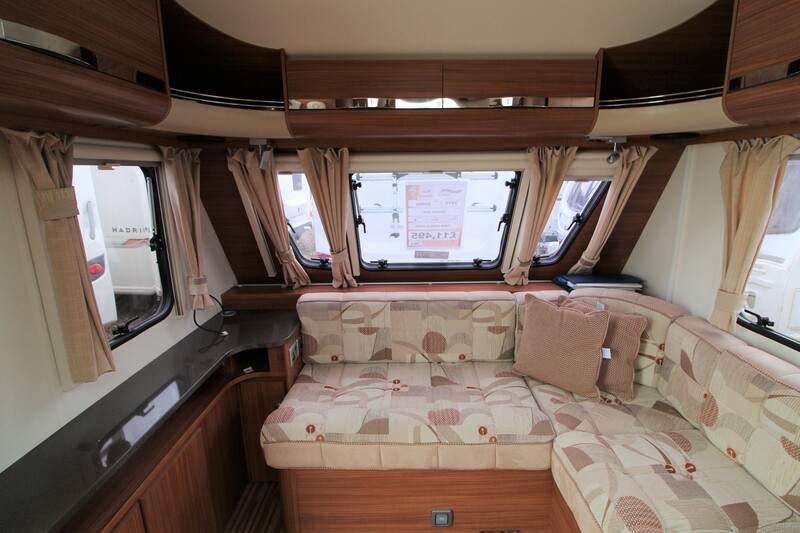 The interior and upholstery has neutral and warm tones which is complimented by the darker shades of wood throughout the Adria. The kitchen area benefits from huge amounts of storage and worktop space. Under the L Shaped worktop, there is a very large cupboard which has enough storage space to provide a full family with food for a good couple of weeks. 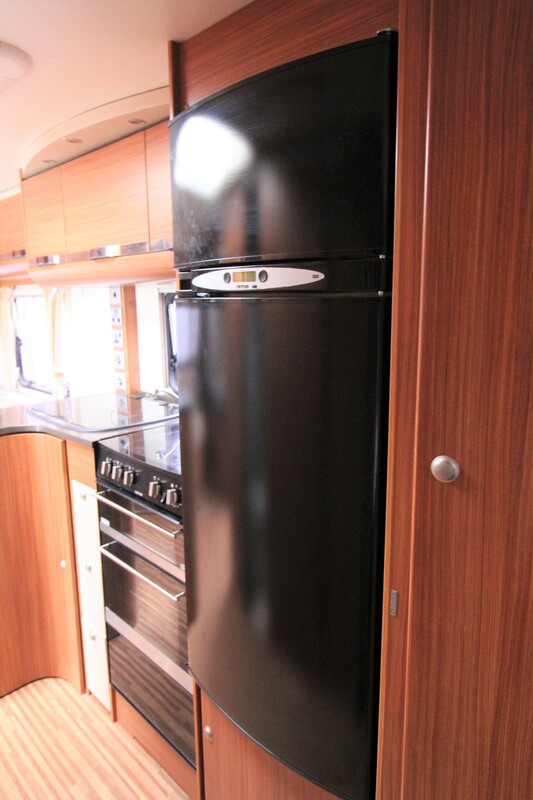 Here you will also find a hob, oven and grill and 240V Sockets. 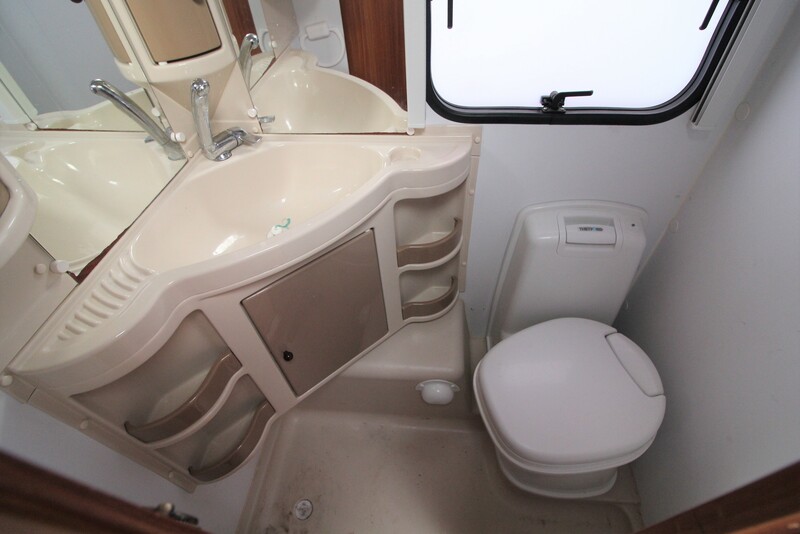 The family bathroom is split into a large shower area and a separate cassette toilet and vanity sink, there is additional storage space here also. 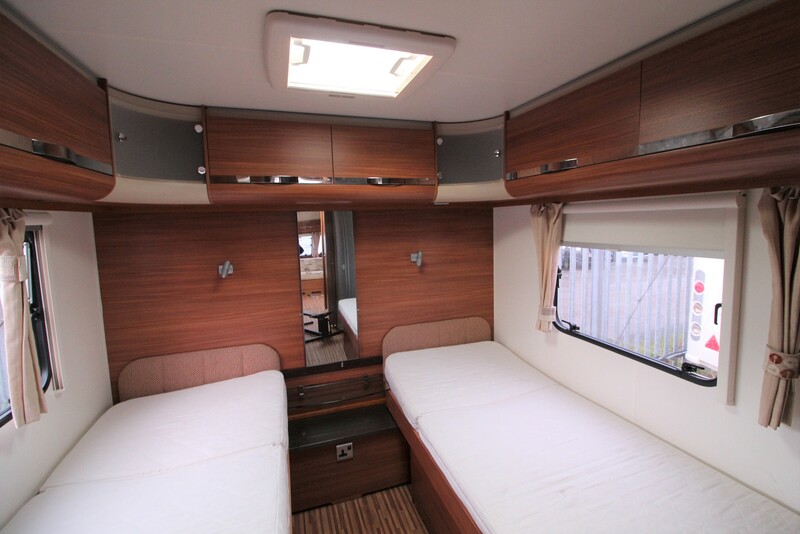 The rear of the Adria is taken up by the bedroom which cleverly benefits from fixed single beds which can be pushed together to provide a large, comfortable double bed whichever your preference. 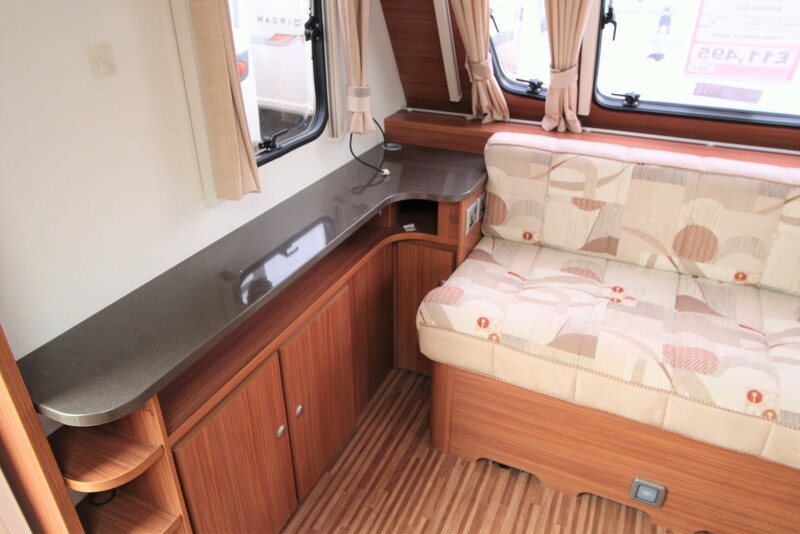 This is a very well designed caravan with a stunning interior which would be perfect for couples or small families. Must be viewed. 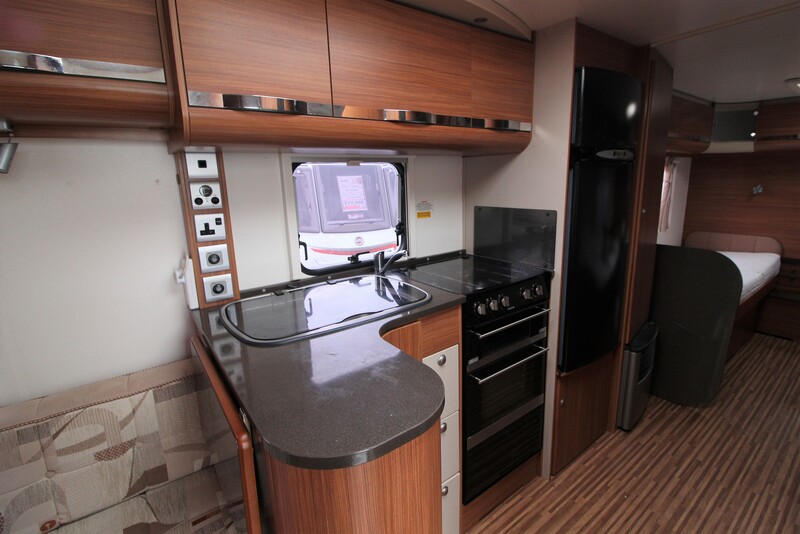 If you're looking for a caravan with an exciting layout then this is the one for you. 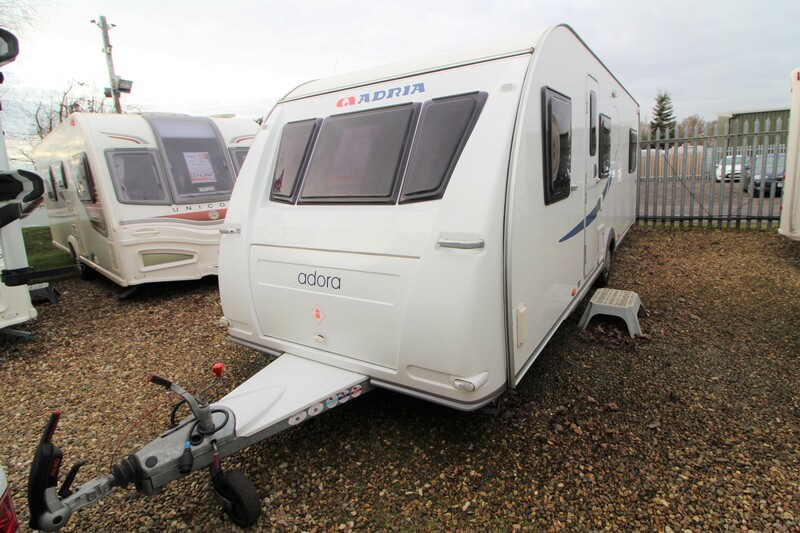 This Adria has the benefit of two fixed single beds at the rear that can be either used as separate beds or can be pushed together to create a double bed. The L Shaped lounge provides ample space for the whole family to convene at meal times, there is a large table which is height adjustable and is also used as part of the bed base to create a large double bed. 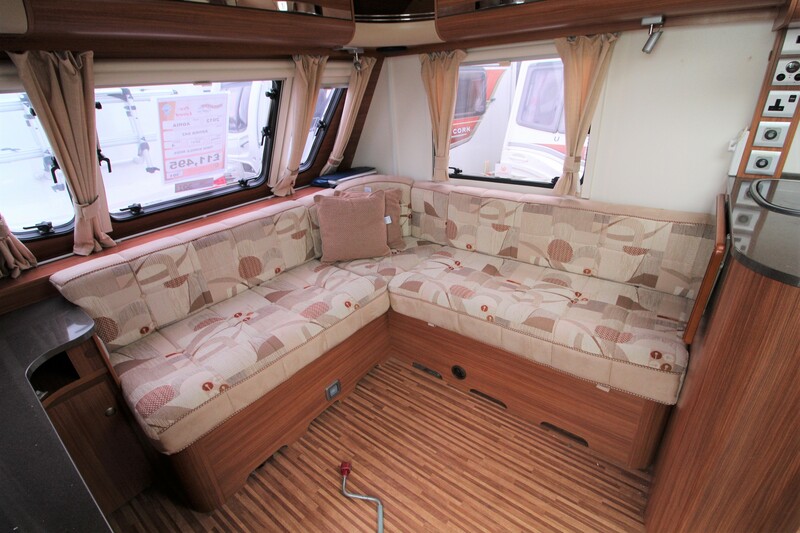 The interior and upholstery has neutral and warm tones which is complimented by the darker shades of wood throughout the Adria. The kitchen area benefits from huge amounts of storage and worktop space. 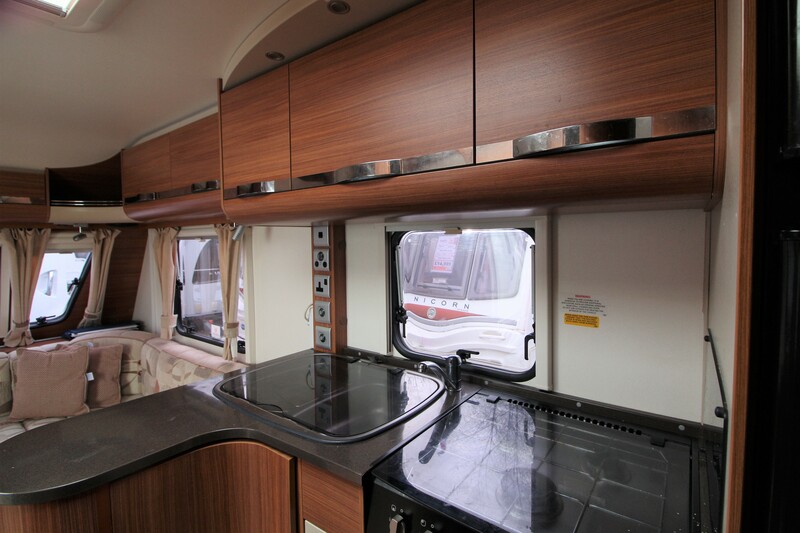 Under the L Shaped worktop, there is a very large cupboard which has enough storage space to provide a full family with food for a good couple of weeks. 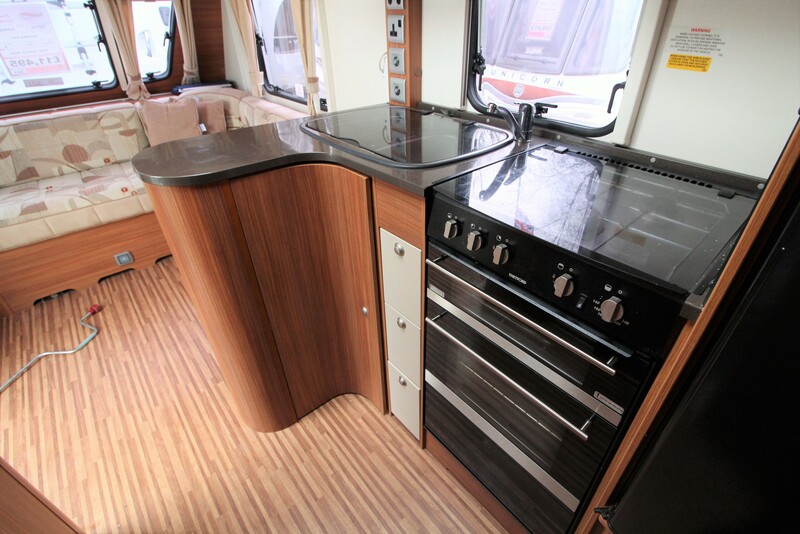 Here you will also find a hob, oven and grill and 240V Sockets. 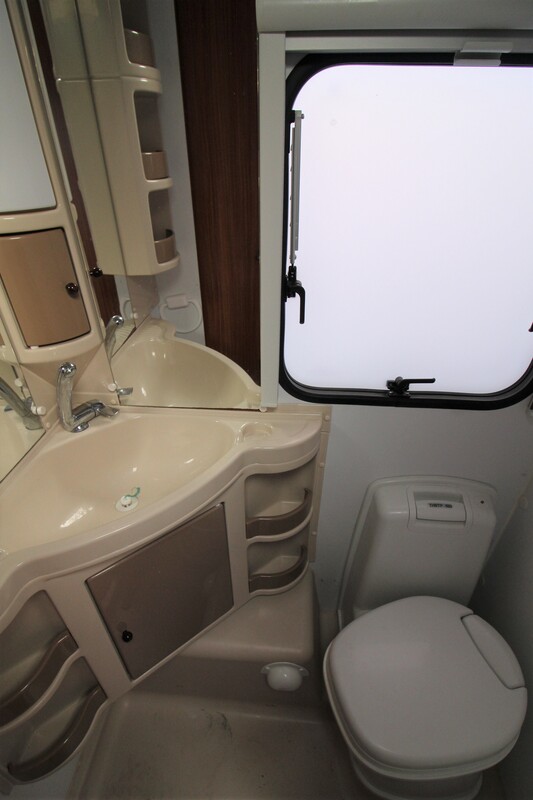 The family bathroom is split into a large shower area and a separate cassette toilet and vanity sink, there is additional storage space here also. 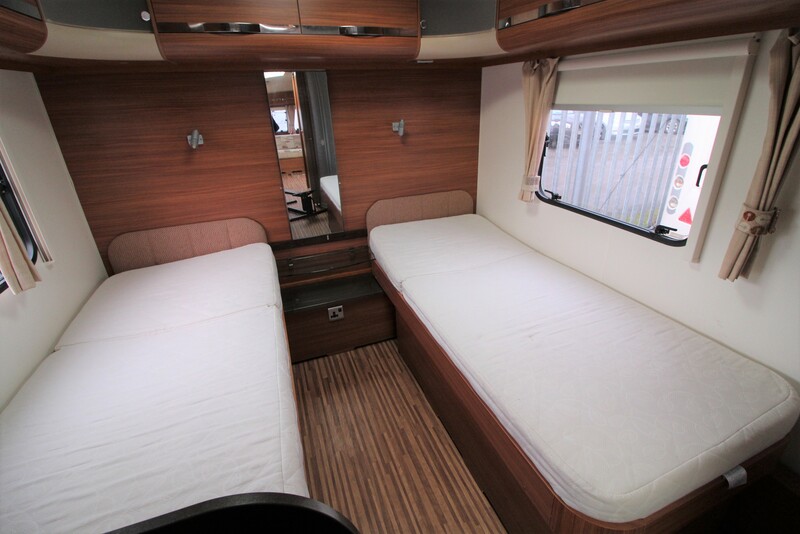 The rear of the Adria is taken up by the bedroom which cleverly benefits from fixed single beds which can be pushed together to provide a large, comfortable double bed whichever your preference. 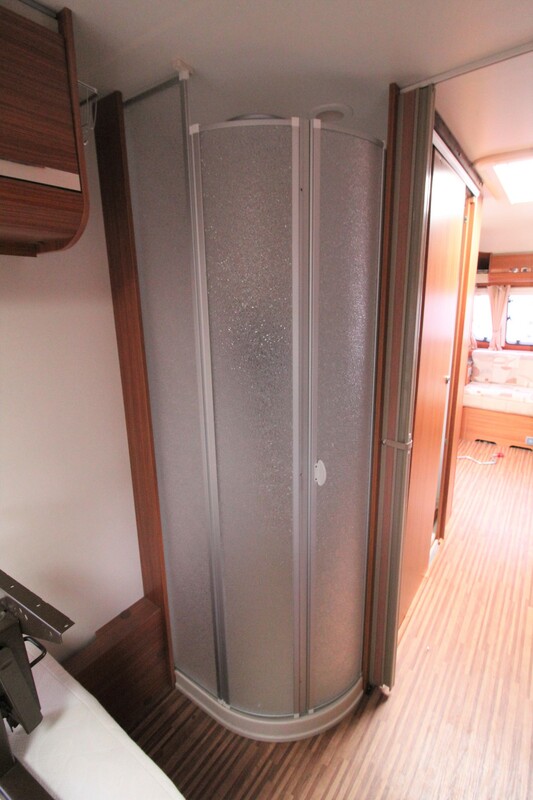 This is a very well designed caravan with a stunning interior which would be perfect for couples or small families. Must be viewed.